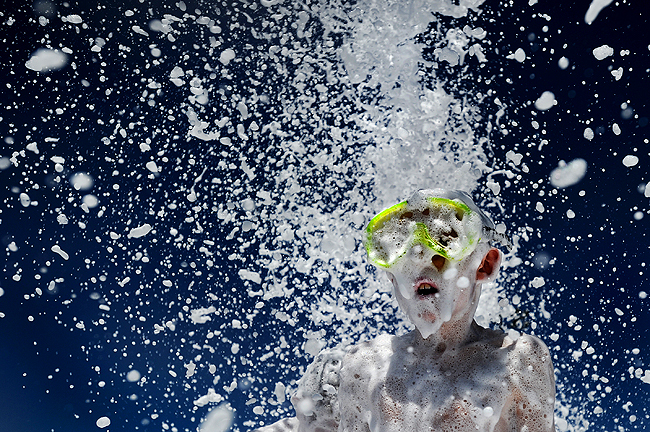 "A young boy attempts to find his location after clearing his goggles in the foam at Foam Day in Lehi, Saturday, July 24, 2010. In its second year, Foam Day is a new annual event where firefighters create a field full of nontoxic foam for families to play in." I worked the holiday last weekend. What holiday? I had the same question. Apparently the state of Utah shuts down for "Pioneer Day." You can read a "factual" Wiki entry about it here. Between my two assignments, which were Pioneer Day related, I had about five hours to burn. I heard about this Foam Day event in Lehi (the one Lance Booth, our former intern, shot last year), so I figured I’d take initiative and venture over to make some more art for the paper. Well, for about 24-hours I smelled of soap, my eyes were red and burning. Not to mention, I am surprised my phone still works, my wallet took a day to dry out, I ruined a perfectly good note pad, my shoes, socks and clothes were drenched (and soapy), and on top of that, had no idea what I was shooting (or seeing out of my own eyes for that matter). But I had a blast. "Jeff Wolf of Benjamin is a sculptor of his life's experiences, actual memorials and moments captured in time, viewed and experienced through his own eyes. "I have these dreams, and these dreams will keep reoccurring until they're so vivid in my head, that when I finally can't take it anymore, I just start creating," Wolf said. "It's like my hands are just tools, I am not doing anything, it's just coming to life on its own through my hands."" There is something about cowboys that gets my attention from the second I see them. So it's no wonder that I've been doing a lot of stories in South Utah County recently. My last subject was Jeff Wolf; sculptor and buckaroo. The minute I met Wolf I was intimidated. There was no escaping that he was anything but a western prodigy. 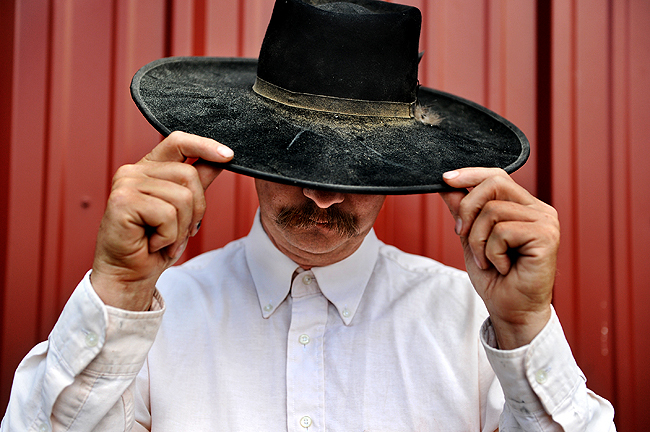 Born and raised in the Western desert of Utah, he spent most of his days on horse back and riding bulls. If that wasn't enough, his artwork was down right breath taking. At this point, I wasn't sure I'd be able to stick my 24mm in his face with all these overwhelming characteristics. Little did I know we'd connect very, very quickly. Instead of shooting pictures my first day, we sat down to get to know one another during an interview. After he began talking of his life experiences, I literally pinched myself a few times. The way he described his methods of creating art and his personal thought processes, I thought I was dreaming. Why? Because he was speaking aloud many ideas and same thoughts I have about myself and my photographs. From wanting each piece he creates to be the best, art being valleys and peaks and, wanting to learn other things as well as his craft, the visions he has for new pieces, and more. I could could go on, and on how much we thought alike on many different fronts. I was just glad to hear that other artists think equivalently. Simply put, he was an inspiration. 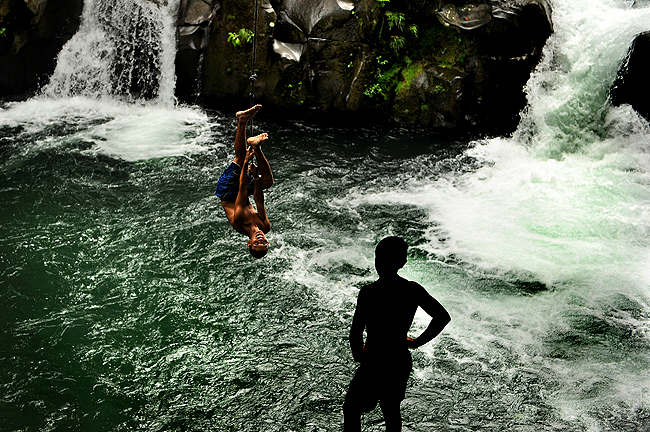 "A local teenager swings upside down before splashing into the water area known as "salto" in La Fortuna, Costa Rica, Saturday, July 3, 2010. Salto in Spanish literally means jump." 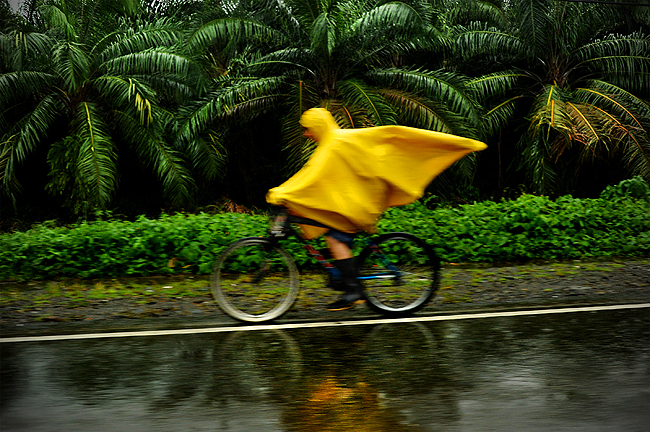 I am still trying to get through my Costa Rica pictures from my trip earlier this month. 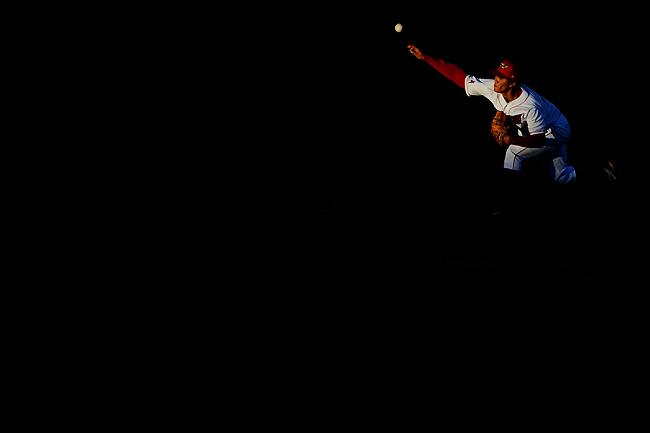 While most of my images are toned, I am more or less trying to get an edit together before throwing them up. So I will probably be putting some outtakes up between now and whenever I decide to get through the edit and post the rest. 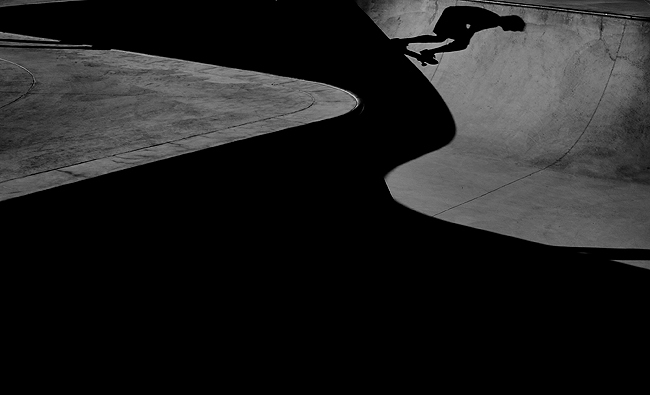 "James Roh of Ohio skates the bowl at the Heber City skate park, Friday, July 23, 2010." Former super intern and friend James Roh visited the Beehive for some good photo fun this week. Roh who is finishing up school at Ohio University, and currently working on some personal projects in California, decided to visit us photogs of Utah PJ as his camera sits at Nikon for repairs. One thing he wanted to do while living in Utah, but never got to do, was swim in Deer Creek reservoir. So a group of us did just that. Afterward, I wanted to shoot some images of him skating nearby in Heber City. It was good having him around, now maybe I'll have to make a trip to Cali. 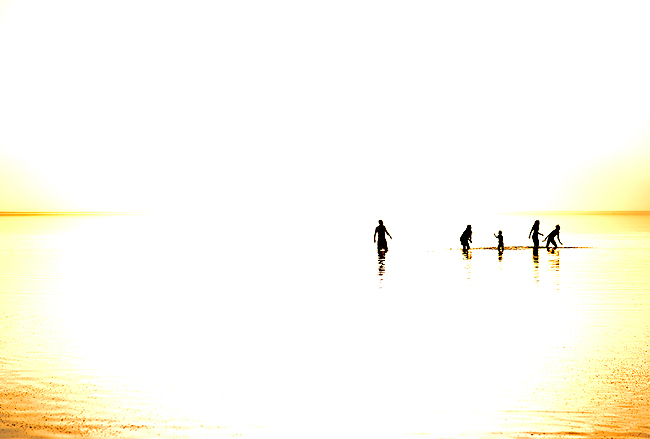 "A visitor effortlessly floats on the Great Salt Lake at Antelope Island State Park in Syracuse, Utah, Saturday, July 17, 2010." Today, I was given fairly minute, obvious advice by a subject who has turned out to be one of the most inspirational folk I've met in Utah to date. He said, "I try to vision every where I go, whether I've been there or not, be it this very road I drive every day, as new and fresh, as I've never been there before." What great advice. Sure, I've probably thought that before, but never practiced the saying. The gentleman that said the above is my current story subject. 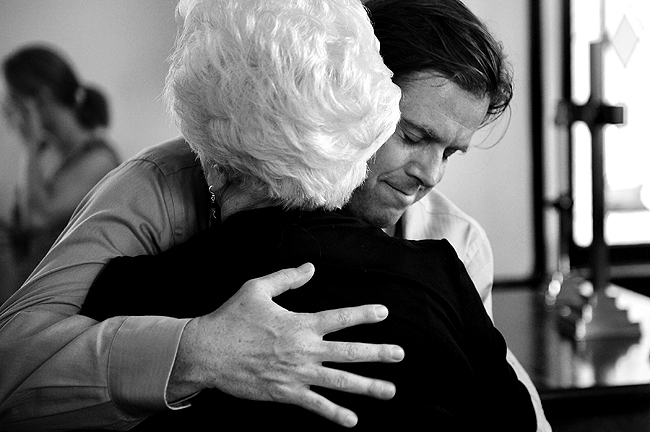 Full of wisdom and is a incredible artist - more on him to come. With that, I had been Antelope Island State Park before, but never floated. So it was all fresh. I cannot wait to go back and shoot some more at a later date. Not many people out, but the sunset was amazing, and I liked the above and this frame. "Jeff Jolley hits from the trap on hole No.16 during the semifinal match of the 112th Utah State Amateur Golf Tournament at the Alpine Country Club in Highland, Saturday, July 10, 2010. Jolley was eliminated by to Stu Gold." I never thought of it this way until Guy Reynolds of the Dallas Morning News said it. Golf "action" is rather oxymoronic. 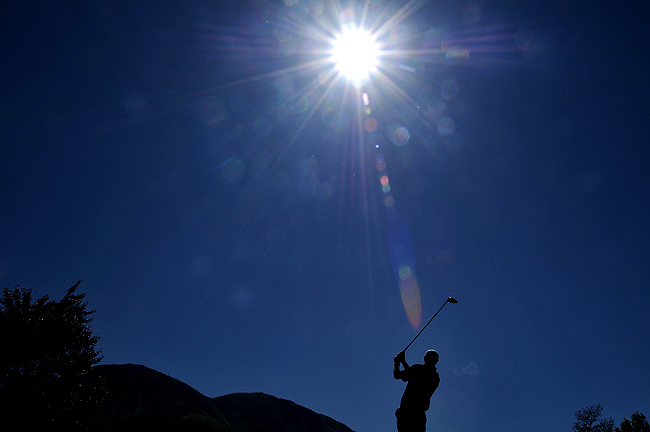 The beginning of his post over of the DMN photo blog summed up golf impeccably. 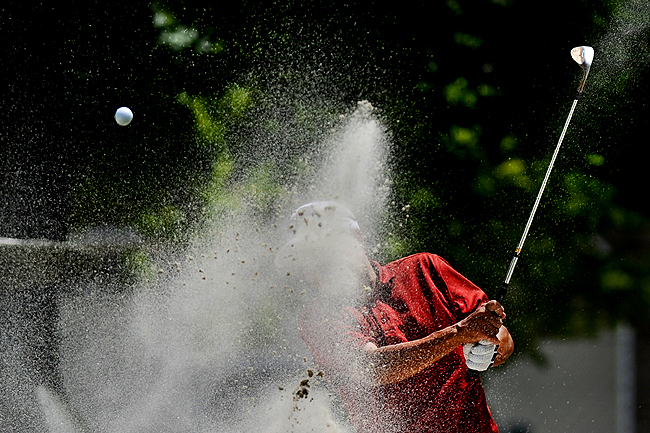 Basically, unless something is flying, such as: sand, water, grass, or a club, things are fairly standard. And even then, well, it's just golf. Well, in my eyes that is. 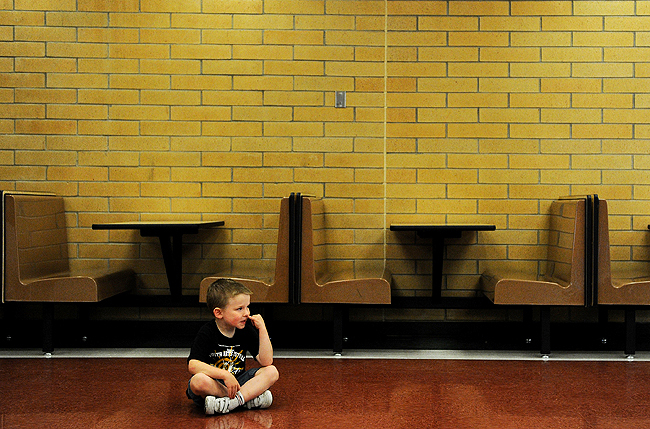 "Caleb Moller, 5, of Spanish Fork picks his nose in the super-heros dance class during the Spanish Fork City's Arts Council Youth Arts Clinic at Maple Mountain High School, Tuesday, June 22, 2010. The Youth Arts Festival is a two week creative arts experience for children ages 3-18 that aims to engage and enrich all children through music, dance, art, literature, drama, photography, and much more." Couldn't help myself but to take this. The event was a snooze fest and I think pictures of kids crying, fighting and picking their nose was all that kept me interested. Alas, I am sure his mother won't enjoy this. 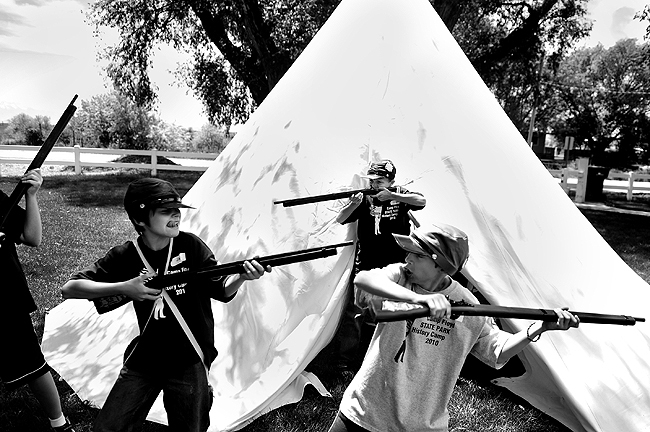 "During lunch break, Chase Shaw, 11, of Cedar City (back center) and peers combat one another in a fake conflict at Camp Floyd's history camp, in Fairfield, Wednesday, June 23, 2010. Camp Floyd's history camp is so popular with kids and parents, they have had to extend it with two more sessions." Right before vacation I shot a couple of assignments - one being a summer camp. I wasn't sure what to expect as I drove out west to Fairfield. I had gone to sport camps when I was younger, but never a history camp. When I pulled up, I was surprised to see a bunch of young boys decked out in old costumes; guns and all. I had thought they'd be reading books or something. After I introduced myself, the camp leader told me they were about to have an hour lunch break and insisted he run the kids through a small performance for me. I told him I'd rather wait around, but he wanted to do it. So I acted like I shot it, didn't fire a single frame. Why? Because I knew how I was when I was younger at summer camp during lunch. I'd inhale my sandwich and drink and then goof around for the remaining 55 minutes. And that's exactly what I got. I am glad I got there when I did to get the kids being kids. 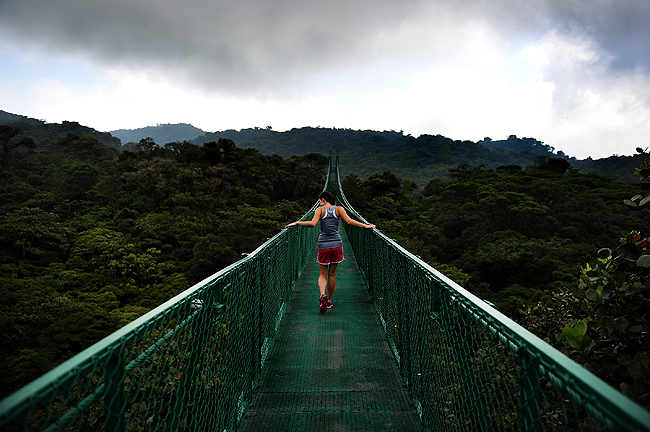 "A tourist holds onto the side of the rails on the Selvatura suspended bridges in the Monteverde Cloud Forest, in Monteverde, Costa Rica, Wednesday, June 30, 2010." I am surprised - I still have limited Internet. But thanks to my friend David Hobby, I found a local place here in Santa Elena that has more powerful Internet. He was much help in my trip here to Costa Rica. So obviously I had to get another picture up. Now I cannot promise anything else as I'll be moving about three-hours northeast tomorrow morning. "A local woman, otherwise known as a tica, waits in her car on the main street in Santa Elena, Costa Rica, Wednesday, June 30, 2010." I am currently in Costa Rica for the first time and what an adventure its been in the first 24-hours. Last night, I got in and traveled from San Jose to Monteverde - it's more than a three hour drive. Not only did I have a busted down rental (got screwed over after making the reservation), but it was dark the entire way and the roads were sketchy. From winding roads up and down valleys to the same thing, unpaved and one lane, it was no easy task. Not to mention, add in litters of sleeping dogs in the street (I estimate I passed easily 50 stray dogs), lots of fog and bad windshield wipers, I was mentally drained by the time I got to the hotel. But today was amazing up here in the cloud forest. And the main street has a lot of character. And while I didn't shoot too much, boy does it feel good to just shoot for myself. The Internet is in-and-out at my current location, and well, I don't want to be on the computer right now. My room has no a/c, no tv, no phone. Simply listening to the bugs and critters is all I need. Check back for more, maybe, throughout the week.